Anne Macquarie, board member and founder of Muscle Powered, penned a great opinion piece for the Nevada Appeal today on Narrowing Carson Street. She points out the numerous benefits that could come from the narrowing, not the least of which is a Carson Street that pedestrians feel comfortable crossing. The struggle to revision Carson Street will happen before the Board of Supervisors, the Redevelopment Authority, and the Regional Transportation Commission, but it will also play out in the pages of the Nevada Appeal. There have been several letters recently objecting to narrowing, and in favor of “the way things used to be” (though of course they never were) and for a continued dominance by cars. If you feel that the narrowing is valuable, please consider a letter to the editor saying so and providing your personal experiences and dreams. 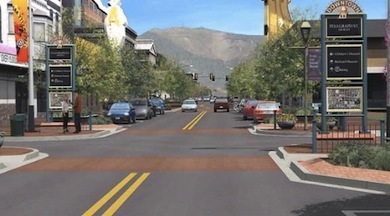 On Sunday, September 5, 2010, the Nevada Appeal ran an article entitled “Main Street makeover: Business owners divided over Carson Street plan.” The article laid out the general vision of what might happen to Carson Street now that some of the traffic has been diverted to the freeway and parallel streets have been or will be improved. It provided viewpoints pro from downtown business owners and con from other business owners and individuals. Some of the same con viewpoints were expressed at the last Carson City Board of Supervisors meeting. I’d like to reply to the article, and to the opposition, with my thoughts. “The streets of our cities and towns are an important part of the livability of our communities. They ought to be for everyone, whether young or old, motorist or bicyclist, walker or wheelchair user, bus rider or shopkeeper. But too many of our streets are designed only for speeding cars, or worse, creeping traffic jams. A second part of the sidewalks enhancement project is also complete. There is now a sidewalk from Sutro Terrace to Arrowhead Dr along the west side of Goni Rd. On the north side there is a new curb, and both sides now have marked and signed bike lanes. There are several drain grates along this street section, which are nice to see since Carson City has a lack of drains that leads to excess water along streets and in intersections, and nice to see them done right, placed appropriately in the gutter so that they work well but don’t reduce the bike lane. This project assists students getting to bus stops, and will get a lot of neighborhood use from the many walkers and bicyclists who live in the neighborhoods so the south. 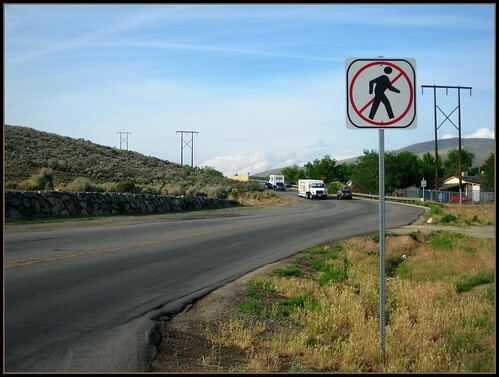 The Fifth Street Project, which added a sidewalk/path on the north side of Fifth St between the Fairview roundabout and Hells Bells / Carson River Rd is now complete. Bike lanes and signing were also added to both sides of the road. This is quite a nice installation, a pleasure to use and a pleasure to look at. It has benefits for Eagle Valley Middle School in providing a safe route from the roundabout to the school (though the roundabout itself is still a bit problematic and should be crossed with caution as many drivers are looking for other cars and not for pedestrians and bicyclists). This is a great example of a complete streets project, adding pedestrian and bicycle facilities to a roadway that was formerly only easy to use for motor vehicles. This project was funding by a Transportation Enhancement grant obtained by Carson City Public Works and Patrick Pittenger. Wikipedia defines complete streets as “roadways designed and operated to enable safe, attractive, and comfortable access and travel for all users.” It goes on to say that, “Pedestrians, bicyclists, motorists and public transport users of all ages and abilities are able to safely and comfortably move along and across a complete street. 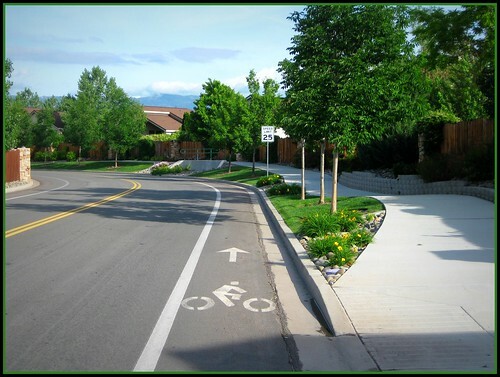 Proponents claim that Complete Streets also create a sense of place and improve social interaction, while generally improving property adjacent land values.” While Carson City does not currently have a Complete Streets policy, we are starting to see more of them around town. The first picture here is of Roop Street at Lone Mountain. As you can see, this is NOT a complete street. In fact, pedestrian traffic is prohibited! Taking the bike over this hill is a bit scary, since the traffic is fast, and the lanes are not well defined. It’s a shame too, because Roop Street/Silver Sage is the only street besides HWY 395 that completely traverses Carson City without interruption. All other routes make you zig zag around town. Northridge Drive – A Complete Street! The second picture is of Northridge Drive, a complete street. Let’s take a look at what’s going on here. Automobile traffic is kept at a reasonable speed with 25mph speed limits and narrow lanes. There are also three round-a-bouts that you can’t see in the picture that keep traffic slower, but flowing. On either side of the car lanes, there are two wide, clearly marked bicycle lanes. The pedestrian sidewalk has a nice planted buffer between it and the faster moving traffic. Not only is this visually appealing, but is also safer for dog walkers and wandering children. Additionally, notice that the sidewalk meanders along the road, side-to-side and up-and-down, creating an inviting and interesting place to walk. Another nice touch is the frequent lighting along the sidewalk that makes the sidewalk nice to use in the evenings too. It is a common sight to see people out on Northridge Drive, both getting exercise and using it as is an alternate transportation route. Like they say, “Build it, and they will come!”. Learn more about Complete Streets over on the National Complete Streets Coalition website.